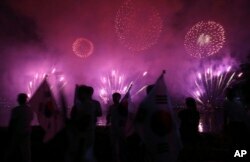 A choir sings as the emblem of the PyeongChang 2018 Olympic Winter Games is seen (top) during its Launch Ceremony in Seoul, South Korea, May 3, 2013. Choi Soon-sil, center, the jailed confidante of disgraced South Korean President Park Geun-hye, appears for the first day of her trial at the Seoul Central District Court in Seoul, South Korea, Dec. 19, 2016. South Korean President Park Geun-hye speaks during a meeting with reporters at the Presidential Blue House in Seoul, South Korea, in this handout picture provided by the Presidential Blue House and released by Yonhap, Jan. 1, 2017. 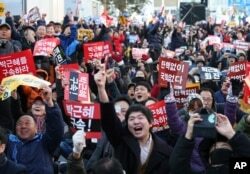 Protesters celebrate after hearing the news of President Park Geun-hye's impeachment in front of the National Assembly in Seoul, South Korea, Dec. 9, 2016. South Korean rapper Psy performs his massive K-pop hit 'Gangnam Style' live on NBC's 'Today' show in New York. The countdown to the 2018 Winter Olympics already started. Do you think South Korea be back on track in time for the Pyeongchang Olympics? We want to know. Write to us in the Comments Section or on our Facebook page.